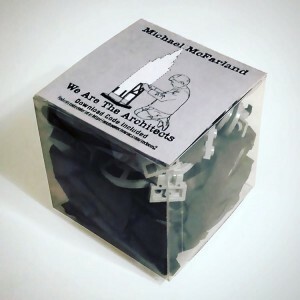 Michael McFarland’s fourth EP in LEGO format (with a digital download code included). Included are 20-35 hand-selected LEGO pieces. Be sure to share whatever you build with the hashtag #WeAreTheArchitects! A stripped-down construction of bombastic anthems, bar ballads and battle hymns atop a foundation of intricate rhythmic backbeats, Michael McFarland’s EP We Are The Architects finds the Cleveland, Ohio singer/songwriter wrestling with questions of mortality and to what lengths one should go in pursuit of a dream. Boasting a substructure, both percussive and melodic, composed almost entirely of sounds from the body and strings of his acoustic guitar, McFarland assembles a set of songs concurrently meticulous and raw. Earthbound melancholy and cloud-piercing hope are the raw materials as McFarland constructs his alt-rock skyscraper.